This function block is used to (over)write the elements of a user defined data structure. The data structure is connected to the input X. The new values for the items of the structure can be given by the inputs X0 to X7. 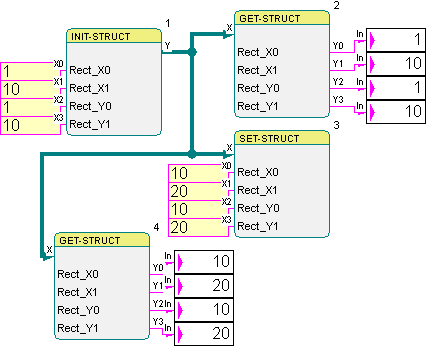 After overwriting the items with a new value the data structure will be written back to the input signal X. 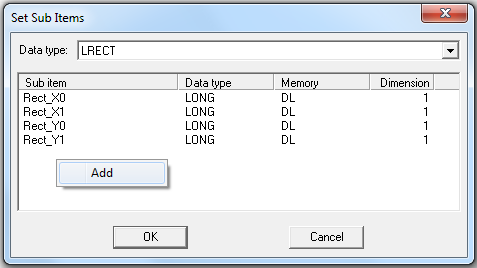 There can be at most eight inputs to set the values of the items. In Online mode the items are set one by one, starting with the first one on top. If the same item is defined for different inputs, the last assignment overwrites the ones before. The following example shows how a user defined data structure type LRECT is first defined with the initial values 1; 10; 1; 10 and then the items are set with the new values 10; 20; 10; 20.